Haruki Murakami is acclaimed as one the most interesting present-day writers of short stories and novels. He is Japanese, but influenced by Western writers such as Flaubert and Kafka. "The elephant vanishes," title story of a collection of short stories, is set in a small town in a suburb of Tokyo. The town used to have a zoo, but it closed. Only an elderly elephant remains, living in its own elephant house and looked after by its 63-year-old keeper, Noboru Watanabe. The outside part of the elephant house is solidly built cage, surrounded by a strong fence, ten feet high made of iron bars anchored in concrete. In addition the elephant has a steel cuff, a shackle, round its right hind leg, attached to a 30-foot-long chain. Between the evening of 17th May and the next day, the elephant is found to have vanished, along with its keeper. Murakami is good at depicting the everyday world, and he is engaging to read. This story includes the political controversy in the town about whether to keep the elephant when the zoo closed and, when it vanishes, he depicts newspaper stories of a recognizable kind about the disappearance. The narrator is interested in the elephant and keeps a scrap-book of the published newspaper articles. As readers we are on the edge of the ordinary: a small suburban community with a lone African elephant. But why the iron-bar fence and the steel shackle? We barely notice when the almost ordinary becomes strange, the barely plausible becomes impossible. The elephant did not escape. It is no-where to be found, despite extensive searches. And no large elephant footprints are seen on the muddy grounds around the elephant house. The steel shackle that used to be round the elephant's leg is still intact. It is still locked, and there are only two keys, both still in place, one locked up in the police station and one locked up at the fire station. Then the narrator meets a young woman, as part of his work life. The two get on well together. They like each other. and something seems to be developing between them. They go out for a meal. The narrator cannot help talking to the woman about his preoccupation: the vanished elephant. The evening before it disappeared, after opening hours, he tells her, he was on a cliff overlooking the elephant house, observing the affection between the elephant and its keeper, which was not expressed during the day when the public would visit, and he noticed that the size difference between them started to get less. The elephant seemed to be shrinking. Did the elephant get so small that it could slip out of its cuff and squeeze through the bars of its cage, and the bars of the fence, and go off with its keeper, of whom it seemed so fond? The young woman avoids seeing the protagonist again. As it seems to me, Murakami is doing what the surrealists were trying to do, in depicting how the unconscious seeps into consciousness, and sometimes even pervades day-to-day life, though he does it better. His ordinary world and the alternative world interpenetrate in ways that enable each to throw light on the other, and enable us to think about our minds and ourselves in new ways. And, far more interesting than the surrealists' mere depictions, with Murakami there is always the relational. How does our individuality, with its peculiarities and unconscious aspects, affect our lives with others, and how do our relationships affect our sense of self? Murakami, H. (1994). 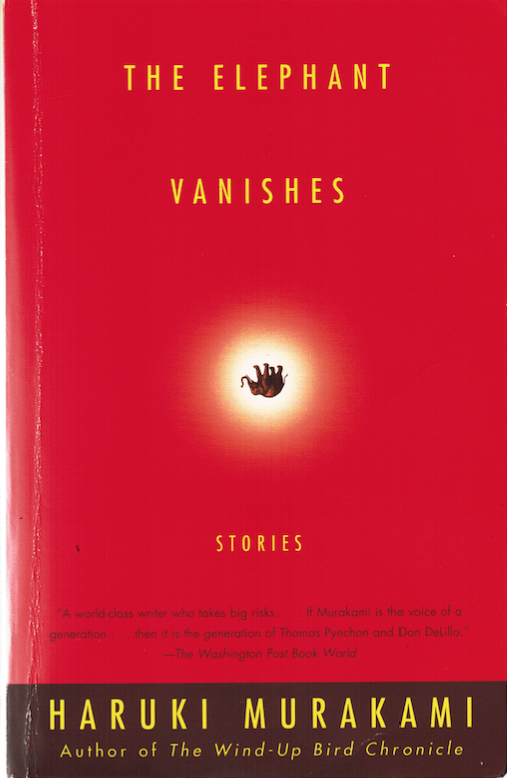 The elephant vanishes: Stories (A. Birnbaum & J. Rubin, Trans.). New York: Vintage.